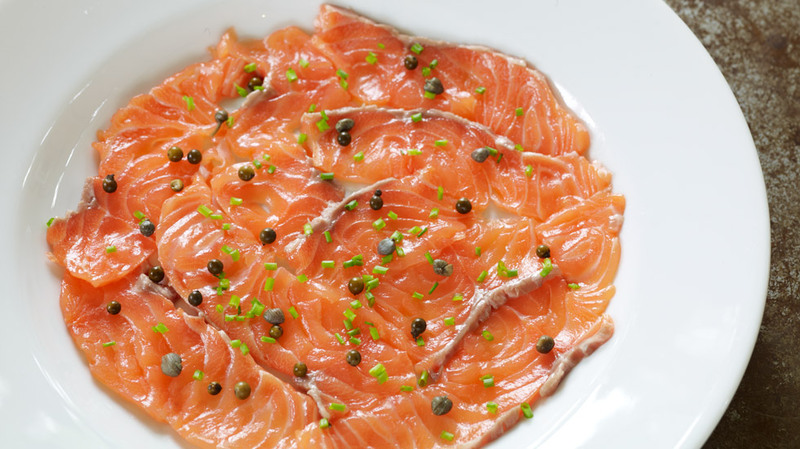 Seared Salmon Carpaccio — Laura Santtini | Life is Delicious! Carapccio is said to have been invented in 1950 by Giuseppe Cipriani, founder of the legendary Harry’s Bar in Venice. He originally used meat and named the dish after Vittore Carpaccio, a Venetian painter known for the charachterisitic red and white colours in his art. This way of preparing food – thinly slicing and serving a raw ingredient – is also now widely used for meat, fish, vegetables and even fruit. Using a sharp knife, cut the salmon into thin slices (as if it were smoked salmon). If you can’t get them really thin, you can always put them between two pieces of greaseproof paper and flatten with the heel of your hand. Arrange the slices on an ovenproof serving plate, without overlapping, to cover the entire surface. Season with salt flakes and freshly ground black pepper. Mix together the olive oil, umami pasteand lime juice and drizzle over salmon. Sprinkle over the peppercorns and capers. Leave to stand for 10 minutes so that the flavours can socialise. Preheat a hot grill. Put the plate under the hot grill for one minute only, so that the salmon is warmed through but not cooked. Sprinkle with chives and serve at once.